As with the shirt, I cannot wait to wear this beautiful hat that matches the shirt I bought. Its a great match folks. Fantastic hat. It looks like a trucker hat in the pic but it’s actually more like a baseball cap in person. I love it. 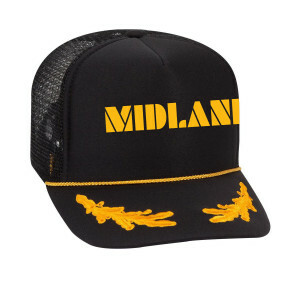 This is an awesome hat; great quality, great look, the embroidery is high-quality, good color and stands out well. You simply can't miss the "Midland" logo. Recommended to all! Great hat, top quality embroidery. Bonus I was the only one with it on Saturday and Stagecoach. Cheers! Super fun hat! Lower profile than most trucker hats and nice quality.